I've been an audiophile for quite a long time now, but until more or less a year ago I had lived happily without headphones (except for my AKG K26P I use with an old iPod) and I didn’t even think about having any. It’s not that I never tried – sure I did. I borrowed, a couple of times, some popular cans like the HD600, the AKG K701, some models of Audio-Technica (and some others that I don’t even remember), plus some very decent headphone amps (including the Yamamoto HA-02 for example) but each time my conclusion was the same – it simply wasn’t my way of experiencing music. Firstly, I couldn’t really bear that unbearable feeling of pressure on my head and ears all the time, secondly, this was totally different presentation comparing to what I was used to getting from loudspeakers. I tried hard a couple of times doing my best to find some upsides of headphone listening and finally I let it go, I quit. Loudspeakers it is, I said to myself and I thought the story was over. And it was at least until last year when I realized I was going to spend a month of vacation away from home, and that it would mean spending it without any decent system, hence without my music. A month without music?!! No way! Just iPod? No way! Take my whole stereo system with me? Clearly impossible. So there was only one choice left – some decent headphone system. I knew I would spend this month in one place so I could build a system based on a laptop as a source, a USB DAC, a headphone amp and some nice cans. Problem was, at the time, I only had the laptop. As I wrote a couple of times before – sometimes it’s good to be a reviewer – I had no problem with borrowing a USB DAC, a headphone amp and cans. All I had to do was to choose which ones I wanted. I did my search on the web, especially on www.head-fi.org, and I “discovered” planar magnetic headphones by HiFiMan. Reading comments on their sound I realized that I might actually like it. I also learned that there was one downside – these cans required a powerful headamp to drive them well. After a quick search I found a Polish distributor of HiFiMan – Rafko (www.rafko.com), and also a distributor of one of the recommended amplifiers – LYR by Schiit Audio (Polish distributor - Earmania.pl). Luckily for me both distributors were kind enough to send me the requested products, so I received the LYR and two pairs of HiFiMans – the HE-4 and the HE-5L. As for a USB capable DAC I borrowed the Music Hall dac 25.3 (from Eter Audio). I’ll skip the details, as it's not important for this review, but the point is I spent a wonderful month with planar magnetic cans from HiFiMan. It was a new, amazing experience that changed my mind about headphone listening. In my ears the sound offered by any of these two pairs of headphones was much better than anything I had heard before from “regular” dynamic cans. This time I could easily spend many hours with headphones on my ears (even during very hot days) without any fatigue, neither physical (as these were very comfortable to wear), nor psychological (created by delivering sound so directly to my ears/head). Because of great spacing (as for headphones performance of course), transparency and impressive bass presentation, sound wasn’t THAT different from that delivered by my loudspeakers. It became clear for me that sooner or later I would become an owner of planar magnetic cans. After that test I decided to buy the Schiit LYR for myself, realizing of course that it wasn’t the best amp in the world, but it was great value for money, it offered a possibility of tube rolling, plus it delivered so much juice that it could drive even most difficult loads, like the HiFiMan's cans. As I said it was also clear for me that I would surely buy a pair of planar magnetic cans but before making my choice I still wanted to check the top model from the same manufacturer – the HE-6, and their biggest competitor – the LCD2 from the U.S. Audeze. Thanks to a Polish distributor I had a chance to listen to the HE-6 a few months later and after that I had no doubts that this model performed better, much better than the HE-4 and the HE-5LE, and that it sounded so good I hardly imagined any cans would sound any better. But still before spending a few thousands PLN on cans I wanted to make sure that they were the best my money could buy. I needed to compare them to the Audeze. The latter was also quite a new player on the market but it seemed that over just few years they won the hearts of a huge number of fans in the U.S., but also worldwide. I read many threads about both, the Audeze and the HiFiMan cans, and as with most audio products, I did not get much wiser after that, as there were equally many people preferring one brand over the other as well as the other way around. No easy answer to the question which ones to choose, the HE-6 or the LCD2. There was one thing left to do – listen to the LCD2 myself. Good idea, but almost infeasible in Poland as there was no local distributor of this brand. So I contacted them directly asking to send me a pair of Audeze cans for a review. The answer was positive, and it came quickly. The headphones came much later, but I was happy anyway. Before that I was asked which model I wanted – the LCD2, as in my original request, or the new top model, priced at close to two thousand USD, the LCD3. It took me a while but I chose the latter, apparently clearly better than the HE-6, while I felt that with the LCD2 it might have been a matter of taste, preferences rather than real performance advantage. If I had taken the LCD2 I would have still wondered if, and how much better, the LCD3 were. Marcus Miller, A night in Monte Carlo, Concord Records, B004DURSBC, CD/FLAC. Blade Runner, soundtrack, muz. Vangelis, Universal, UICY-1401/3, Special Edition 3 x CD (1982/1991/2007), CD/FLAC. Patricia Barber, Companion, Blue Note/Premonition, 7243 5 22963 2 3, CD/FLAC. AC/DC, Back in black, SONY, B000089RV6, CD/FLAC. Hans Zimmer, The Dark Knight Rises, Watertower Music, B008645YEE, CD/FLAC. Ray Brown Trio, Live at Starbucks, Telarc, CD-83502, CD/FLAC. Carreras Domingo Pavarotti, In concert, Decca, 4304332, CD/FLAC. Marek Dyjak, Publicznie, UBFC Cd0111, CD/FLAC. Piotr Czajkowski, 1812 Overture, Kunzel, Cincinnati Pops, TELARC SACD-60646, SACD. Wolfgang Amadeus Mozart, Symphonies, Scottish Chamber Orchestra, Linn Records, CKD 350, 2 x SACD/HDCD. Pink Floyd, Wish you were here, EMI Records Japan, TOCP-53808, CD/FLAC. Peter Gabriel, New blood, Real World, 800035, CD/FLAC. 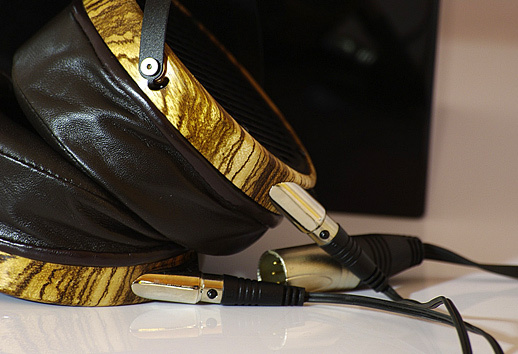 You can buy the Audeze headphones either in a very nice, black, shiny, wooden box or in a travel case. I received the former – large, elegant looking, black with a golden lock. Inside it’s padded with some nice looking, soft, velvet-like fabric. 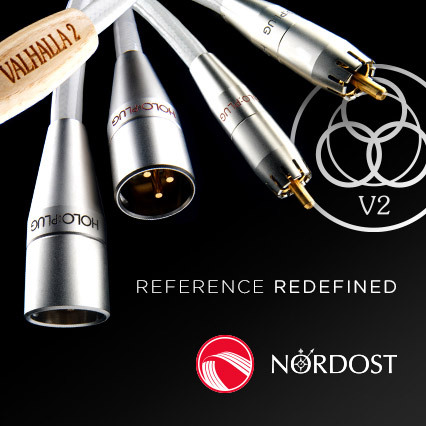 Apart from the cans themselves one finds there two sets of detachable cables – one with a 6.3mm jack, other with a 4-pin XLR plug. At the other end the cables (separate end for left and right channel) are fitted with locking, 4-pin plugs. The interesting and smart feature of the LCD3 is angled headphone connectors, which make moving your head around, with the cans on, much easier. Another smart detail are sloped ear pads made of lambskin leather, with specially molded foam to offer the right amount of firmness. The cans are quite large and really heavy (550g). Such a significant weight comes mostly from wooden ear cups made of Zebra Wood. The ear pads and the headband are made of the same lambskin. 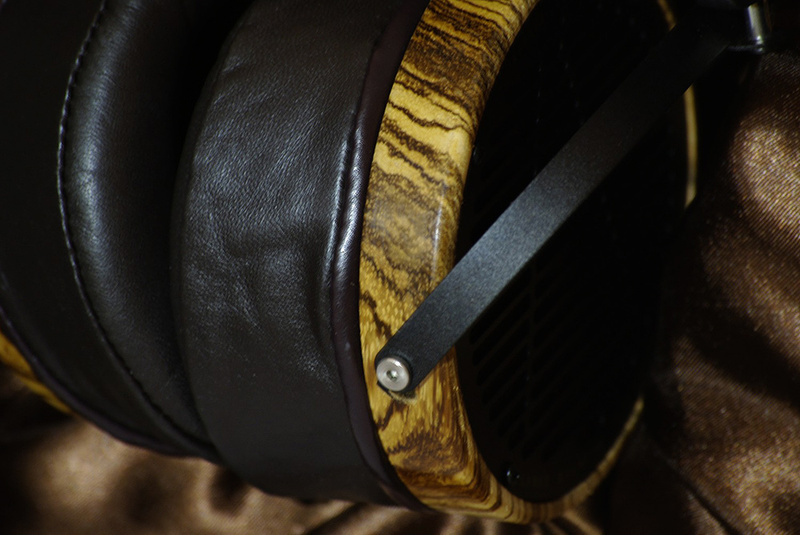 Long story short – the LCD3 are very nice and elegant looking headphones that seemed to be well made. My first use of the Audeze cans was somehow surprising – comparing to the HE-6 (heaviest among HiFiMan’s models) these were significantly heavier, plus they put more pressure on the ears and the head. So to be honest in terms of wearing comfort I preferred the HiFiMans. Weight was one thing, others were velour pads that I preferred over leather ones. Plus there was my prejudice (some might say phobia) against anything I could really feel on my head (that includes even a hat... yes, I know, there is probably some treatment for that) – with the HE-6 it was much easier to forget about them on my head when listening to the music. 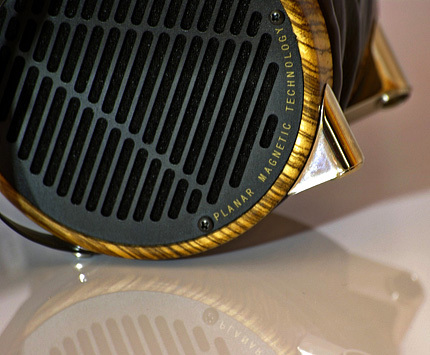 So on my private list points for the looks went to the Audeze (wood and leather are surely more elegant than plastic and velour, although I have to mention that with the HE-6 you get two sets of ear pads, and one of them is made of some leather, or leather-like material), the American cans also got points for some smart solutions (sloped ear pads, angled connectors), but the HiFiMans got points for wearing comfort (of course that was my subjective impression – others might feel the opposite). Audeze says that one of the key advantages of their cans is a special, obviously better, diaphragm material. Most manufacturers (including HiFiMan) use Mylar with special aluminum conductive traces, while the American manufacturer uses material called LOTUS with special alloys in the conductive traces, that is supposed to give “a greater control and lower distortion”. The large, 6.17-square-inch circular flat diaphragm is sandwiched between rows of neodymium bar magnets. When audio signals pass through the diaphragm it moves in and out to produce sound. Because of their large size and super low mass the planar magnetic drivers are supposed to generate significantly lower distortion than conventional headphone designs and in my ears that seems to be the case. As I always like to repeat, the design and theory behind it is one thing, but what I (and supposedly most audiophiles) really care about is how it sounds, not how it should sound. Before I start describing my experience with the LCD3 I have to say that I liked the HE-6 so much that it was hard for me to imagine that other headphones could sound even better; maybe differently, but better? It seemed almost impossible even though my whole experience in audio says: “never say never”, as regardless of how much I liked a particular amplifier/player/loudspeaker sooner or later I would encounter some device sounding even better. So there was hope for the Audeze regardless my delight over the HE-6.. Since I received a brand new pair of cans I let them burn in for a week and only after that I started to listen seriously for the first time. The first session was conducted with the Accuphase E360 (review HERE www.highfidelity.pl/@main-1291〈= ) – an impressive amplifier with high quality headphone output. I remembered the very difficult to drive HE-6 (I listened to 6 month earlier), most of all by their extremely clear and transparent sound with very good stereo imaging, and powerful, well extended bass. Now the LCD3 with the Accuphase delivered sound that was first of all amazingly smooth, rich, and colorful. I was amazed by rich, dense sound this system delivered, with lots of information extracted from recordings, but in general I would describe this sound as a bit dark. It seemed that the HE-6 and the LCD3 went opposite ways – the former preferred speed and transparency, the latter smoothness and great sound saturation but at the cost of transparency and minor but real loss of some details. Obviously that was sound delivered by the system, not just the cans. I suspected that some features of both of elements of the system accumulated and the sound did not really benefit from that, or at least not in all of its aspects. I loved the smoothness and richness of the sound but I needed that supported with more transparency and detail. I was listening to one of the best cans on the market so I had the right to demand more, didn’t I? To be on the safe side – as I explained it many times before, when describing the sound of high-end devices I need to use “regular” words like “better/worse, more/less” and so on, but in such cases those words describe subtle, not huge, differences. In the high-end world those subtleties have more weight than in “regular” hi-fi, as we are looking for “perfect” sound; but still they describe minor discrepancies between different devices. So the real meaning of the Audeze lacking a bit of transparency and detail in this system was: the HE-6, as I remembered it, had a slight advantage in that aspect. Since I listened a lot (6 month earlier) to the HiFiMan cans driven by my Schiit Audio LYR, I decided to use it also now, when reviewing the LCD3. It’s a really nice and powerful amplifier, surely delivering much better performance than one would expect from something at this price level. Surely not the best possible fit for neither the HE-6 nor the LCD3, but it was supposed to give me a better perspective for a comparison between those two pairs of cans. As I mentioned, it is a very powerful amplifier delivering up to 6W into 32Ω, so even though the sound of the Audeze driven by it wasn’t as sophisticated as with the Accuphase, it gained quite a lot in terms of dynamics, energy, and, what I found particularly interesting, transparency. There was no such fabulous richness or smoothness as with the Accu, some details got lost somewhere in the background, although some others were presented more distinctly than before. To be honest, the sound was already damn good and I could easily live with it if it weren’t for this annoying little voice that kept repeating in my head: “that's still not all these headphones can do, you need to squeeze more of them”. Since at the time (and still today) a new product from Schiit Audio – the Mjolnir – wasn't yet available in Poland I had to keep looking for another amplifier offering even better performance. Next choice was pretty obvious – it was the Burson HA-160D. I'm pretty sure that at least some of you know why. If you don't you can check it here www.6moons.com/audioreviews/burson8/1.html . The HA-160D is in fact three devices in one body – a D/A converter, a preamplifier and a headphone amplifier. It is quite popular around the world and among Audeze fans, as Burson together with Audeze and 6moons.com organized a tour of the LCD3+HA-160D set, that was sent to people willing to listen to it and later describe their impressions on 6moons.com. Fortunately, also the Polish distributor of Burson Audio, dc-components, was kind enough to lend a piece to me for an extended period of time. In general, this type of device has its advantages, like space saving - many devices in one enclosure, all you need is a source (laptop for example) and headphones and that's it – a complete system is there. The downside might be... putting a couple of devices in one enclosure, because you might not equally like all of them, as some compromises must often be done when designing a multifunctional device like the Burson. When I started to listen to the LCD3 driven by the Burson I thought that the sound was a bit dull, slightly less spacious than before with other amps. And the impression was the same regardless of a source I used, and some of them were of a very high quality, like the Ayon CD5s and the Soulution 540 Players, or a computer delivering signal via USB cable to one of USB/coax converters like the Soulution 590, the Stello U3, or the Lampizator. I wasn't very happy about it so I decided I had to try something else. The solution was... to use the Burson as a headphone amp but with an external source – the Soulution 540 and a computer with the best USB/coax converter I listened to so far – the Soulution 590, and the TeddyDAC (I appreciated it so much after the review that I bought it for my system). Even though the Audeze cans were much easier to drive than the HiFiMans I still found the “high gain” output a better match for them. The sound opened up, it wasn't dull anymore – treble was clean and crisp. So finally there was nothing, not even a small bit of dullness that could distract me from enjoying the music anymore. The presentation was very fluid, dynamic, with powerful, thunderous even bass, rich, smooth, colorful midrange, and wonderful, sweet, crisp and shiny treble. That confirmed my previous suspicion that the HA-160D was a very good headphone amp and preamplifier, but somewhat not that great (which didn't mean not good at all) DAC. Sure, I confronted it with the TeddyDAC that alone cost more or less the same as the whole package from Burson, so the comparison wasn't really fair. Again – the Burson is not a poor DAC, as no one could deny its musicality. It is simply not as good as the Teddy, or the Auralic MX+. Now back to the system with a separate DAC and a USB/coax converter. As I already mentioned listening session with the HiFiMan HE-6 gave me unforgettable experience that convinced me I would have to build a headphone system with planar magnetic cans. Now continuing listening session with the LCD3 I was still under impression that the Chinese competitor had been more impressive with its speed, transparency, spacing, amazing, deep, powerful and nicely controlled bass, and lots of details given in a very direct or distinct way. Even though the Audeze with the Burson (as headamp) performed better than in any setup before, they still sounded a bit dark, and that meant less distinct details presentation, the sound wasn't so airy, so open, and bass, although powerful, well extended, wasn't that well defined, not so taut. Anyhow, when I stopped comparing my present experience with something I thought I remembered from another session 6 month before, I was truly impressed. The Audeze presented music in a bit different way. The sound was most of all very, very dense, rich, saturated and smooth. It was also powerful, with tons of dynamics. More or less at the same time I reviewed the Bastanis and later the Ardento speakers, both with 15” paper cone woofers, both offering this amazingly natural, powerful, extended bass with truly visceral impact.